Milwaukee Federal Criminal Defense Lawyer - Oberheiden, P.C. Are you under investigation by the Milwaukee FBI, DEA, or IRS? Have you been contacted by the government, received a grand jury subpoena or a target letter from the U.S. Attorney’s Office at 517 E Wisconsin Avenue, Milwaukee, Wisconsin 53202? Are you accused of a crime? Are you looking for advice from an experienced federal attorney? Meet attorney Dr. Nick Oberheiden. Nick serves clients in Milwaukee, Wisconsin, who are looking to avoid or defend unjust criminal charges. Unlike most lawyers you will find in “Cream City,” Nick exclusively handles federal cases—offering clients the unique experience of hundreds of federal criminal cases. Nick is the lawyer that business owners, physicians, health care entrepreneurs, accountants, lawyers and even prosecutors (!) call when they need reliable advice in critical personal legal situations. Example 1: DEA Drug Diversion (Physician): No Charge. Example 2: Drug Offenses (Controlled Substances Act): No Charge. Example 3: Health Care Fraud (Physician): No Charge. Example 4: Search Warrant for Opioid Prescriptions: No Charge. Example 5: Severe Federal Computer Crime: Probation. And, the best thing? Nick does not delegate. There are no junior lawyers or paralegals that will handle your case. If you hire Nick, you get Nick. Personalized. Committed. Knowledgeable. Call Nick today 866-Hire-Nick (this is Nick’s personal cell phone) and put an end to your nightmares! 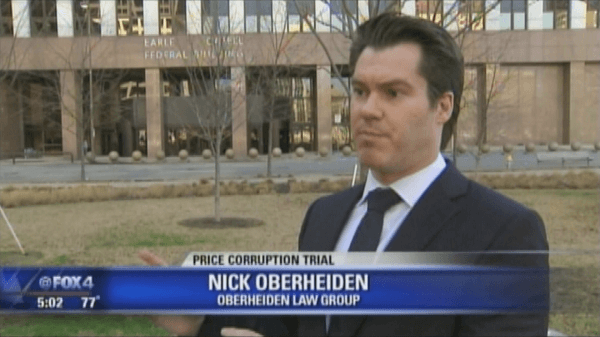 Who Is Dr. Nick Oberheiden? Born and raised in Germany, Nick has moved to the United States some 15 years ago. He graduated law school in Germany, set records at UCLA School of Law (Juris Doctor ’07), and wrote a Ph.D. thesis, which was personally supported by United States Supreme Court Justice Stephen G. Breyer, the Chief Justice of the Brazilian Supreme Court, and other top legal authorities. To add, Nick was trained in negotiations and dispute resolution at Harvard Law School. Nick began to practice litigation at one of the largest law firms in the world, White & Case LLP, at their New York world headquarters in a team of roughly 1,200 attorneys. Nick stood out because of his ability to communicate with international clients in their native language (Nick is fluent in French, German, English, Portuguese, and understands several other languages) and his relentless approach in litigation matters. Before Nick turned 30, he had already represented the governments of various countries in international conflicts and authored a plethora of books and legal articles. Nick has always focused on federal cases. When he opened his own law firm, Nick was perhaps the only lawyer in the U.S. that only took federal cases (besides immigration lawyers) and quickly built a practice known and sought after across the entire United States. Nick has served as lead counsel in federal litigation matters in more than 35 states and Nick has argued cases before FBI and U.S. Attorney’s Offices in every corner of the country—including in some of the country’s most watched federal investigations. Called by media stations as national expert for federal cases and trusted by clients for his exclusive focus on federal matters, Nick now offers his knowledge and help to the good people of Milwaukee, Wisconsin. The Difference Nick Offers: True Federal Experience. 95% of all criminal cases are state cases. That means the vast majority of lawyers spend 95% of their time defending drunk drivers, shoplifters, and people accused of domestic violence. Not so Nick. 100% of his practice is dedicated to federal litigation, government investigations, and federal criminal defense. In hundreds of cases, Nick has built a routine that is hard to replace. Nick knows how federal agents build a case—and what to do against it, when to intervene, how to argue in front of specialized prosecutors, and how to present himself before federal judges. How many federal criminal cases have you yourself handled? What were the outcomes you achieved for your clients in the last 100 federal cases? The truth is, federal cases are quite different than getting a misdemeanor in juvenile court. Federal agents (FBI, DEA, OIG, ICE, IRS) and federal prosecutors are well trained and work together to prosecute offenses that typically run up to 10 years in federal prison, per each violation. Because much more is at stake when it comes to protecting your license and your livelihood in federal courts, you should consider the above test questions when you make one of the most important decisions of your life. Milwaukee is part of the Eastern District of Wisconsin, which is one of 95 federal districts nationally. Federal prosecutors and FBI, DEA, IRS, and OIG agents in Milwaukee and throughout Milwaukee County, Ozaukee County, Racine County, Waukesha County, and Washington County are tasked to investigate and prosecute federal offenses. The federal courthouse in Milwaukee is located at 517 E. Wisconsin Ave in Milwaukee, Wisconsin 53202 and the Green Bay federal courthouse is located in the Jefferson Court Building, 125 S. Jefferson St. in Green Bay, Wisconsin 54301. The following are among the most frequently questions clients ask attorney Dr. Nick Oberheiden. What Type of Cases Does Nick Take in Milwaukee, Wisconsin? Nick’s focus lies on federal white-collar offenses. Nick has represented hundreds of people and businesses in federal health care fraud cases (DEA opioid fraud, Medicare fraud, illegal kickbacks, False Claims Act investigations, Civil Investigative Demand, Stark Law cases etc.) throughout the nation. In money laundering, federal fraud, wire fraud, mail fraud, mortgage fraud, bank fraud, securities fraud, bribery, public corruption and computer crime cases, Nick has convinced even the toughest prosecutors and judges that his clients are innocent and must not be prosecuted. Why Does the DEA Target Wisconsin Doctors? Milwaukee physicians are targeted by the DEA in investigations focusing on prescription abuse, medically unnecessary opioids, drug diversion, and responsibility for accidental patient overdoses. The investigations are serious and centrally organized by the Department of Justice in Washington DC. Physicians of all specialties that have prescribed controlled substances to chronic pain patients or dispensed opioids outside the ordinary course of their practice (“pill mill”) should immediately consult with DEA defense attorney Dr. Nick Oberheiden to not become the next victim of search warrants and federal arrest of hard working physicians. What Penalties Could Milwaukee Physicians Face in Opioid Investigations? 21 U.S.C. 841 under the Controlled Substances Act governs penalties for pain prescription violations. Pursuant to this drug diversion and drug distribution statute, physicians, who are found guilty of having illegally dispensed controlled substances, face severe criminal fines, a revocation of their DEA and medical license, as well as up to 10 years federal incarceration per occurrence. How Does Sentencing in Federal Cases in Milwaukee Work? Sentencing in Milwaukee federal courts typically follows the uniform federal sentencing guidelines. After a defendant pled guilty or was convicted at trial, the U.S. Probation Office determines a sentencing recommendation to the presiding judge. The probation officer will take the seriousness of the offense, the injury of victims, the damage created, the defendant’s prior legal history, and many other factors into consideration before suggesting a sentencing range. Judges at the United States District Court for the Eastern District of Wisconsin in Milwaukee are not bound to follow the sentencing recommendations, but they often do leaving little room for upward or downward deviations from the probation officer‘s recommended sentence. What Should I Do When the Milwaukee FBI Wants to Interview Me? Put simply, you should never speak to Milwaukee FBI or other federal agents about your involvement (or non-involvement) in a federal case. The risk of you making incriminating or damaging statements without even noticing is exponentially higher than you helping your case. Even if you feel that you have nothing to hide, an experienced federal criminal defense attorney (and most certainly federal law-enforcement officers) may have a different position. What Is Nick's Experience in Federal Criminal Cases? Federal cases are all Nick handles. While probably every criminal lawyer you may find online also offers representations in DUI and other state cases, Nick believes that true experience can only develop by arguing and defending cases –exclusively— in front of federal agencies, federal prosecutors, and in federal courts. Nick has appeared before virtually every federal agency including the FBI, the IRS, the DEA, the U.S. Secret Service, the Office of Inspector General, Department of Health and Human Services, the Department of Defense, the Department of Justice, the Department of Homeland Security, and other federal law enforcement agencies in charge of prosecuting federal offenses. Does Nick Only Handle 'High Profile' Cases? No. Indeed, Nick routinely defends clients in high profile cases, but Nick is available to anyone who needs help with a federal matter, be it an individual client or a company. How Much Does It Cost to Hire Nick? Nick offers fair rates, often below average. He will work with your budget and find a number that reflects the stage of the investigation and your personal financial means. For example, there is a difference between you needing a lawyer to handle your upcoming federal criminal jury trial versus you just need someone to answer some initial compliance questions regarding federal law. Just call Nick and find out how he could help you within your budget. Call 866-Hire-Nick. How Can I Engage Nick's Services? The easiest step in your case is to connect with Nick. Call 866-Hire-Nick and reach Nick personally. No secretary, no junior lawyer. Nick will find the time to discuss your questions, free and confidential, and will give you concrete and honest guidance how he can help you without ruining your budget. Dr. Nick Oberheiden limits his practice to federal law and he is admitted in the Eastern District of Wisconsin (Milwaukee, Green Bay), among other federal courts. If you would like to speak with Nick or meet him, call him directly on his mobile phone, including on weekends, at 866-Hire-Nick. You can also contact him online. All consultations are free and 100% confidential.